While not quite Supersonic, The Gulfstream G650 is the fastest business jet on the market today. The Gulfstream G650 was formally launched as an internal company project in May 2005, and publicly unveiled on March 13, 2008. At the public announcement occasion, company executives stated the new model will become Gulfstream's largest, fastest and most expensive business jet when it enters the market. The G650 has a cruise speed of Mach 0.85 to 0.90, with maximum speed of Mach 0.925 and will have a range of up to 7,000 nmi (13,000 km). The new jet will use the new Rolls-Royce BR725 engine producing a maximum thrust of 17,000 pounds force. Gulfstream states that with a weight of less than 100,000 pounds (45,360 kg), it will be able to land at small airports avoiding the busy airports around the world. To provide better usage of the internal volume, Gulfstream designers rejected the usual circular fuselage cross-section in favor of an oval which uses a flatter lower portion. The cabin is to be 8 feet 6 inches wide and 6 feet 5 inches (1.96 m) high. The fuselage is of metal construction and composite construction is used for empennage, winglets, rear pressure bulkhead, engine cowlings, cabin floor structure and many fairings. The sixteen oval cabin windows are 28 inches (71 cm) wide. The aircraft controls will be completely fly-by-wire, with no mechanical control between pilot and flight surfaces. The surfaces will be moved by a dual hydraulic system. More airliners today are using fly-by-wire, but only one current business jet (Falcon 7X) is so equipped. 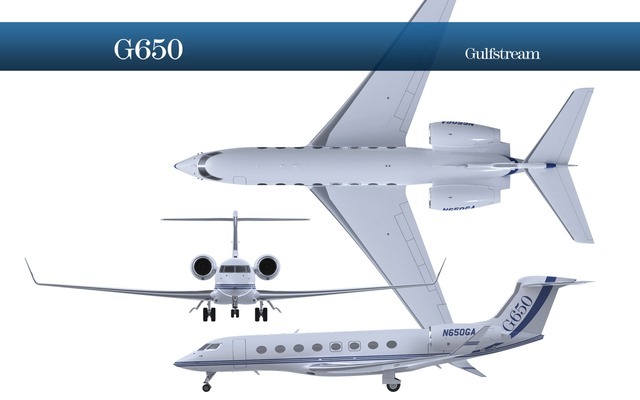 The G650 will share yoke and column with the G550 in an effort to receive a common type rating. Flight testing for the maximum operating speed of Mach 0.925 was announced as completed on May 4, 2010. 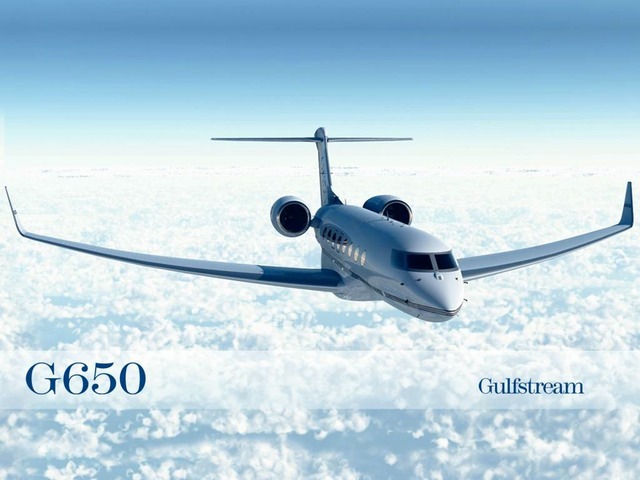 Gulfstream reported on August 26, 2010 that the G650 hit a maximum speed of Mach 0.995 during a dive as part of its 1,800-hour flight test program.